Never does anything good come out of wars. It would be ironic yet not far from truth to say otherwise about World War II. 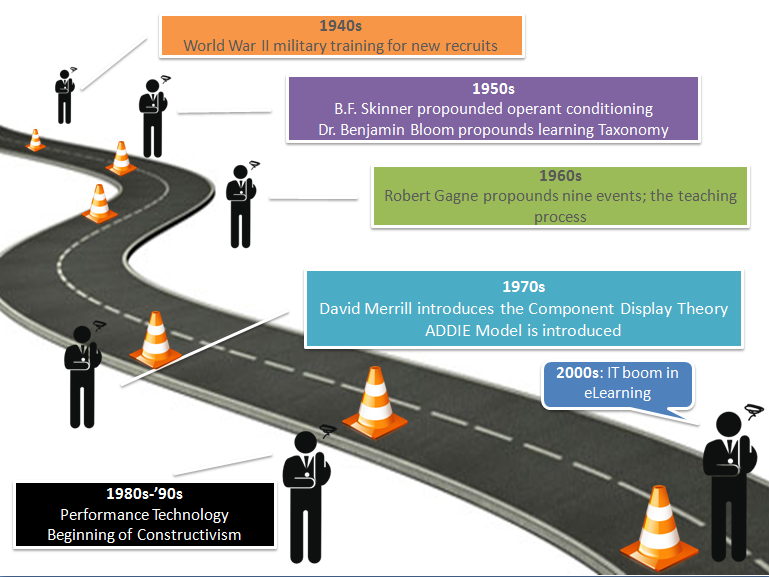 Amidst all the killing and bombings of WWII, the only good thing that came about was the shaping of the concept now commonly known as Instructional System Design or ISD as we know it today. The inordinate loss of life and property and the relentless need for personnel at war during World War II led many civilians to war fronts as a desperate measure by countries like US. These civilians needed elementary training to help them perform technical tasks. These included basic infantry, carbine field stripping, navigation, etc. which depended on the division and role. Since behaviourism influences the learner to a great extent, most of these training programs were based on operant conditioning which postulates that behaviour can be modified by its consequence, which could be positive or negative hence altering behaviour. Also known as Instrumental conditioning, this learning methodology was first studied by neurophysiologist Jerzy Konorski (1903-1973) but was later propagated by behaviourist B.F. Skinner (1904-1990) to whom we will dedicate more than a few articles (he is well deserving of that). Coming back to military training, promotion to a higher rank (positive reinforcer) for strategically managing the division is operant conditioning through positive outcome and increase in the hours of guard duty (negative reinforcer) for disregard for rules is operant conditioning by negative outcome. Who could exemplify it better than the military? Why this is so important an event in the evolution of ISD is because it was the first time chunking and the use of learning objects to acquire a particular behavioural competency was implemented. This concept of measurable learning objectives formed the basis of many learning theories and models that would be propounded in the near future. This team led by Dr. Benjamin Bloom in 1956 defined the three learning domains (Cognitive, Psychomotor, and Affective) and representing their levels through a vocabulary of measurable and quantifiable verbs. The Cognitive domain was later revised in the 1990’s. Thereafter, Robert Mager asserted on the importance of objectives and defined the constituents of a quality objective, opining that objectives should be clear and attainable for the learner. Robert Gagne propounded the nine events of learning which actually touched on all the stages in a teaching process. And later can David Merrill with his Component Display Theory in which he explained that the instructional strategies highly depend on the nature of the content being taught. It was a two dimensional model of content and performance and defined primary and secondary presentations forms and the higher the number of primary and secondary presentations forms used, the more effective the instruction. Simply put, though it addressed the cognitive domain which in itself is a complicated domain involving different types of memory responding to different instructional strategy, it lays more emphasis on presentation and that’s why is deemed as the Bible of ID by many instructional designers. And that brings us to the web based instruction which we know as elearning today. The coming up of authoring tools and the limitless options that come with it, sky is the limit.